In two days, the Seahawks have made two major deals with star players, first with quarterback Russell Wilson and now with Wagner. A day after the Seahawks’ Bobby Wagner said his deadline to get a new contract was “now” the Seahawks reached agreement with him on a four-year extension that will keep the standout middle linebacker with the Seahawks through 2019. The deal is worth $43 million, according to several reports, with $22 million guaranteed. The contract makes him for the moment the highest-paid middle linebacker in the NFL, though Carolina’s Luke Kuechly recently had an option picked up for the 2016 season that would pay him a guaranteed $11.1 million and remains in talks with the team on an extension that could pay him more. Wagner’s deal averages $10.75 million. NFL Network first reported the news, and official confirmation came a little later in a Tweet from owner team Paul Allen who wrote that “Seahawks signed LB @Bwagz54 to a 4 year extension tonight!” Late Saturday night, Allen Tweeted a picture of Wagner and Seahawks general manager John Schneider as Wagner signed his contract. Wagner is entering his fourth season in the NFL and like quarterback Russell Wilson, also entering his fourth season, became eligible for an extension after the 2014 season. Had he not agreed to an extension now, Wagner could have become an unrestricted free agent following the season. 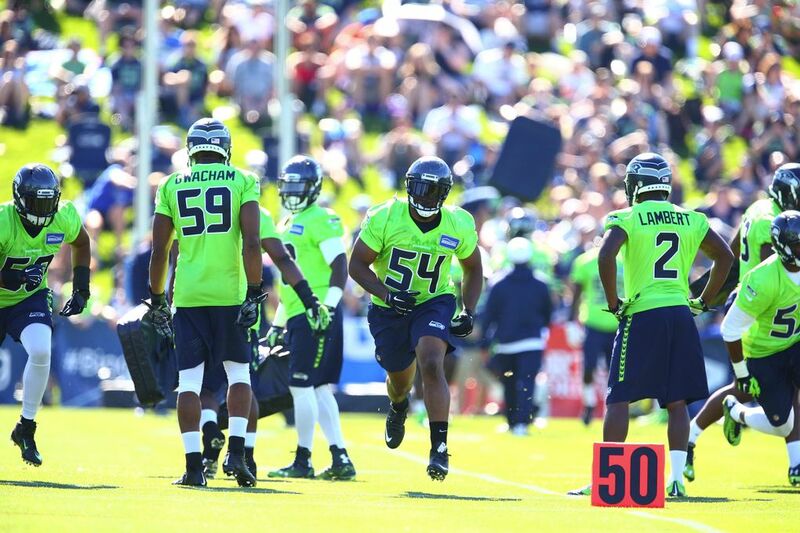 And like Wilson, Wagner got it done just as the team began training camp. On Friday, Wilson signed a four-year deal worth $87.6 million, meaning the Seahawks in two days committed $130.6 million to keep Wagner and Wilson in Seattle through 2019. Wagner had been slated to make $977,427 in base salary in 2015 and $1.37 million including bonus. Wagner was named to his first Pro Bowl last season and finished second in All-Pro voting behind Kuechly. Getting Wilson and Wagner signed to extensions was regarded as a key objective for the Seahawks this offseason, the two each critical pieces of the team’s future. Getting a deal done with Wagner means Seattle now has the bulk of its defense under contract for at least the next three years — cornerback Richard Sherman, safeties Kam Chancellor and Earl Thomas, linebacker K.J. Wright, defensive ends Cliff Avril and Michael Bennett, and now Wagner (also signed through 2017 is newly-acquired cornerback Cary Williams, expected to take over as a starter for the departed Byron Maxwell). Offensive stars Wilson, Marshawn Lynch and Jimmy Graham are also signed through 2017. Chancellor, though, remains holding out of camp, skipping practice again on Saturday as he tries to get more money from the Seahawks. After practice Friday, the former second-round draft pick out of Utah State made he clear he wanted some long-term security quickly. Wagner and the Seahawks had been said to have begun more serious discussions on a new contract in June. Seahawks coach Pete Carroll had said he was optimistic a deal would get done quickly and was proven correct with the news Saturday. Wagner has been one of the shining examples of Seattle’s ability to find and develop talent after arriving as a relatively unheralded draft pick. He started all but three games his first two seasons as the Seahawks emerged as a Super Bowl title winner. His value was made even clearer when he missed five games last year at midseason due to a foot injury, during which the Seahawks struggled. When he returned in Week 12, the Seahawks embarked on a late-season run of defensive dominance to match any in the NFL’s recent history. Wagner is now the sixth Seahawk averaging at least $10 million per season after Wilson ($21.9 million), Sherman ($14 million), Lynch ($12 million), and slightly ahead of safety Earl Thomas and Graham, each making $10 million a season. With contract details still rolling in it was unclear how much salary cap room Seattle has left for 2015 — the Seahawks had roughly $4 million after the signing of Wilson. The Seahawks will face some tough decisions on a few other players who can be free agents after the 2015 season, including left tackle Russell Okung, guard J.R Sweezy and linebacker Bruce Irvin.